Nothing spoils traveling faster than finding yourself unprepared for inclement weather or temperature changes that you didn’t anticipate, which makes finding the perfect travel jacket of critical importance. The best travel jacket is lightweight, warm, can protect you from the wind and weather, and also has plenty of style to make sure that you are never out of place. And while you’d think with all of the different jacket options out there on the market today it be rather easy finding the best travel jacket for you, nothing could be further from the truth. All those options out there can cause a lot of frustration, a lot of confusion, and a lot of anxiety. Some jackets have the fit, the fabric, and the reputation that you’re after but just aren’t all that attractive, may not be lightweight, and might set you back more than a few hundred dollars – something that a lot of travelers are going to balk at. By arming yourself with the inside information below, however, you’ll not only better understand exactly what to look for in the perfect travel jacket but we’ll also highlight some of the top options you have to pick and choose from. Each and every one of the jackets highlighted below are considered by many to be amongst the very best of the best, the kinds of jackets the travelers have been utilizing for quite a while now to make sure that they are ready to rock ‘n roll with their travel outfit regardless of where they may be traveling to – or where they may be traveling from! 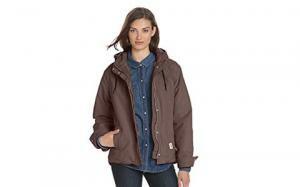 What to look for in the best travel jackets? Each of the jackets below highlight all of these specific features and then some, making them amongst the very best of the best travel jackets on the market today. Carhartt clothing has a legendary reputation for building some of the strongest, most durable, and longest lasting clothing designed specifically for the American worker – particularly those out in the fields, out on the farms, on construction sites, and generally getting their “hands dirty” on a daily basis. The brand has branched out in recent years and become one of the most influential American workwear clothing brands in the country, but it still has this backbone of creating very utilitarian clothes – and this particular women’s jacket is no exception. Taking full advantage of the legendary Carhartt cotton material that uses a proprietary weave pattern to protect against weather, to protect against wind, and to protect against everything Mother Nature can throw at you while remaining relatively lightweight, this is certainly one of the best travel jackets on the planet today. Featuring a zippered front, fully flannel lined hood and interior, triple stitching at all of the main seems, and ribbed cuffs and a waistband to block any wind from channeling your bones while wearing this jacket, it really doesn’t get much better than this. Right out of the gate, this Carhartt jacket is going to be a little bit heavier and a little bit step – but again, that’s because of the proprietary weave pattern of the material used throughout. Carhartt has done a great job at “breaking in” most of the jackets that they sell to consumers today, but you’ll still ever feel completely comfortable in this jacket until you’ve worn it for a couple of weeks consistently. Give it between 10 and 14 days of regular use and you’ll find this jacket has molded to you and your body, becoming the kind of jacket that you wouldn’t want to share with anyone but to keep only for yourself! Another of the great Carhartt jacket options, this jacket is not specifically designed for the American worker so much as the American consumer that’s looking to travel while fighting back against everything that winter weather brings to the table. This jacket still features the legendary Carhartt cotton material and the cotton weave that protects against wind, rain, and abrasion, and that means that this Carhartt women’s travel jacket is going to be more than a little bit stiff “right out of the box”. Washing the jacket a couple of times before you wear it for the first time (following the instructions on the tag, of course) is going to soften the material considerably, but you’ll really have to wear it on a consistent basis for a week or two for the material to “relax” around your body – and then it’s going to feel like it was custom tailored just for you! The amazing designers and engineers at Carhartt have found a way to produce a cotton jacket that is as wind resistance and as weather resistant as this one while still remaining relatively lightweight. The insulation value on this travel jacket is through the roof thanks to the faux shearling materials that are throughout the inside of the jacket, providing you with just another layer of top-notch insulation against the cold. You’ll find a number of different pockets on the exterior of the jacket (including a zippered pocket at the chest), as well as a handful of internal pockets that are perfect for travelers that want to protect their important travel documents and money. The attached to the hood is a game changer when you’re fighting back against weather, wind, snow, and rain, and you’ll never have to worry about windchill ripping through the cotton material or the insulation of this jacket no matter what! Modeled after the incredibly popular Carhartt jackets specifically designed for ranch hands working in the shadow of Rocky Mountains, this particular travel jacket from Carhartt is lightweight but still designed to protect against pretty much everything that Mother Nature could imagine throwing at you. Featuring a zippered front with a snap button flap to provide for extra protection against the wind, this Carhartt jacket (like almost every other one of the Carhartt jackets the company produces) takes advantage of the Carhartt “duck cotton” and the proprietary weave pattern that has made this company legendary for its durability and capabilities standing up to extreme temperatures and wind. The interior of the jacket features a faux sherpa lining, guaranteeing that you are able to stay nice and toasty even when the mercury starts to drop. Even still, the jacket isn’t overly warm when you are wearing it in the early spring or the late fall – though this is the kind of jacket that you’d want to travel with when the temperature start to get a little bit warmer. The built-in hood is integrated directly into the jacket rather than removable like so many other travel jacket options out there, and this actually provides for better protection against wind, weather, and precipitation in particular. If you’ve ever had a travel jacket hood to fail on you and allow water or snow to come in through the collar because it snapped on or zipped on, you know exactly what we are talking about. With two hand pockets and an internal pocket, travelers are also going to be able to appreciate the excess storage that this jacket brings to the table. The ability to keep your important travel documents, identifying documents, and cash or credit cards close up against your chest and not in an external pocket is a huge advantage you might not be able to leverage with other jackets on the market right now. This jacket was not originally intended to act as a top-notch travel jacket, but instead was created for the American workingman that needed a jacket that could stand up to anything Mother Nature threw at him while at the same time standing up to anything that his job or career could throw at him as well. There’s a reason why you see so many men on construction sites today, and across all trades, really, taking full advantage of all the big benefits that Carhartt brings to the table. Before this brand became a “trendy” pick for casual consumers it was one of the most trusted names in the realm of American workwear – and a lot of that is because of the patented and proprietary cotton duck material that they leverage. This cotton duck material utilizes a unique weave pattern that gives it a lot of extra strength, and a lot of extra durability, and a lot of extra protection against wind, water, and weather – and that’s why it has become such a popular choice for those that find themselves in less than ideal working situations. This jacket is relatively lightweight, features the 100% cotton duck material that Carhartt is so known for, but also has rib knit cuffs and waistband to keep wind out of the inside of the jacket with a full hood and zip up front that guarantees you stay nice and toasty no matter what. The interior has been lined with a quilted flannel material, and the flannel rolls all the way up into the hood as well. You won’t have to worry about getting chilly with this jacket on, no matter where you might find yourself traveling! As a general rule, the jacket is a little bit oversized, so if you want something that fits a little bit closer to your skin you’ll want to look for an option that is a size or two smaller than you usually purchase. 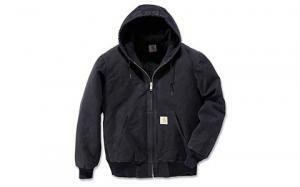 However, order your regular size and you’ll be able to layer inside of this jacket without any discomfort. Lightweight, impeccably designed, and very attractive (as well as quite formfitting), this Carhartt jacket borrows some material elements from the American workwear line this company built its reputation on but is much closer to a fashion jacket than anything else – and that certainly helps those that are looking for a lightweight travel jacket to take with them on trips all over the world. Featuring the 100% cotton duck material that has made Carhartt world-famous, this jacket is going to protect against wind, water, and weather better than pretty much anything else you’ll find on the market today. It features a full zip up front, hand pockets, internal zippered pockets, as well as a hood that attaches to the jacket but can also detach if you don’t think you’ll need it or just don’t want to deal with the extra weight. Sleeves have been lined with quilted nylon to provide an extra layer of weather and water protection, and do a good job at stopping the wind from writing up your jacket sleeves as well. At the end of the day, there are plenty of different travel jacket options you’ll have the opportunity to pick and choose from. 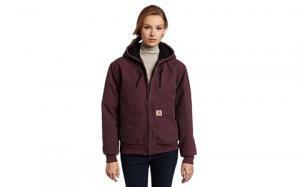 But as you can see from the list above, Carhartt jackets are head and shoulders above the rest of the pack. Relatively inexpensive (especially compared to more traditional “fashion house” and high-end designer jackets), Carhartt jackets are built off of a legendary reputation for durability, reliability, and protection against everything Mother Nature sends your way. The jackets above represent the very best of the best travel jackets are available and you really cannot go wrong choosing any one of them as your constant travel companion going forward!